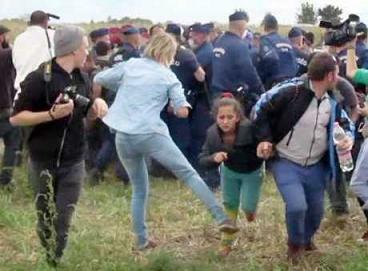 A Hungarian camerawoman caught on video kicking and tripping migrants near the Serbian border has offered a qualified apology for her behavior. The 40-year-old was fired by the right-wing N1TV online channel after footage of her kicking and tripping migrants Tuesday near the village of Roszke went viral on social media. In the she said she had been in a state of shock since the incident, but denied accusations of racism, the Guardian reported. “The camera was shooting, hundreds of migrants broke through the police cordon, one of them rushed to me and I was scared,” she wrote. László added that she was willing to take responsibility for her actions, but went on: “I’m not a heartless, racist, children-kicking camerawoman. I do not deserve the political witch-hunts against me, nor the smears or the death threats.